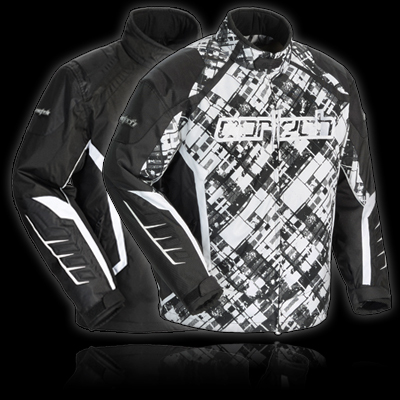 Lightweight design and Cortech’s history of performance apparel combine to make the Blitz 2.1 Snowcross Jacket. A combination of 300 denier Carbolex® and 840 denier Oxford materials make for a light but durable outer shell while a 100% waterproof and breathable membrane guards against the elements. Body temperature is regulated by back and underarm vents and a zip-out liner that features 200gm insulation in the body, 120gm in the neck and 180gm in the sleeves. Cortech’s patented (US Patent #8,156-573 B2) Aqua Barrier Under-The-Helmet-Hood keeps rain/snow from going down the back of the neck. • 300 denier Carbolex® Lite outer shell. • 840 denier Oxford overlay in shoulders and elbows. • 100% waterproof and breathable membrane guards against the elements. • Phoslite® reflective material and Cortech’s® signature reflective rear triangle for increased visibility. • Back and underarm climate control vents. • Aqua-Barrier fleece under-the-helmet hood(U.S. Patent #8,156,573 B2). • Two hand warmer pockets, vertical zippered map pocket, internal cargo pocket and mobile phone pocket. • Fleece lined collar and cuffs are soft, yet durable. • Durable two-way ESO main zipper closure. • Inner waist drawstring for a cinched fit. • Updated stretch Lycra snow cuff at thewrist with thumb hole. • Zip-Out liner with a waist gaitor attached features warming 200g polyfill insulation in the body, 120g in the neck and 180g in the sleeves.